We supplied and installed all of the brown aluminium bifolding doors and gabled window into this fantastic extension in the Kent countryside. Aluminium bifolding doors. Creating the perfect space. Due to the size, beautifully thought-out design of the extension and the great mixture of tradition and modernity, it was always going to completely transform this property. Already a large barn property, the customers wanted to maintain the traditional feel of the rest of the property, the decision was made early on to use a significant amount of timber in the extension. In terms of function, the homeowners also wanted to be able to open up the entire extension in the summer making it the perfect room to just relax in but also, to throw parties. 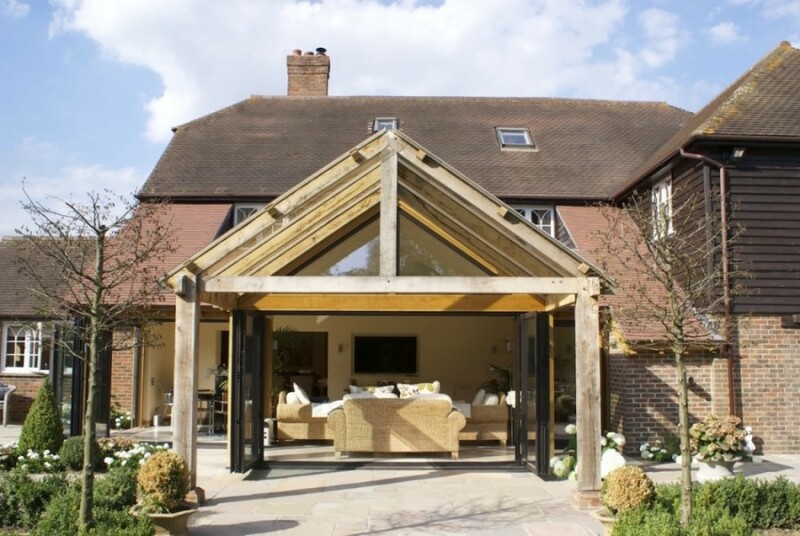 So, with their thin frames, our aluminium bifolding doors were the perfect fit for the job. Sliding doors would not have allowed them to “open up” the extension in the way they wanted to. We also were required to install the shaped triangular windows into the gable above the bifold doors. Always keen to marry up the colour with the rest of the property and the timber being used in the extension, we needed to use a fitting colour. With any RAL colour and the Smart Sensations range to choose from at our showroom, the couple very quickly fell in love with Cocoa Brown, which we also used on this project. So, after the meeting in the showroom to decide on bifold opening configurations and colours, our surveyor visited when the openings were ready for him to measure. We then got all of the metal on order and everything fabricated. Around 6 weeks later, our team was there to fit all 6 of the slim frame aluminium bifolding doors and shaped windows into the extension over two days. It all went absolutely The end result is something that we and the homeowners are absolutely over the moon with, and from the finished photos, it’s not hard to see why!